Okay, so I probably have no idea as to why I am posting today. If you have been following me on my Instagram, you will realize how I have been spending days working on the DIY packaging. I’ve made cupcake toppers and DIY packaging labels and I can’t help but feel excited about them. They are SUCH CUTE BABIES! So, yeah, I basically need to get the menu card flyers printed and upload one over my Facebook Page and I am sorted! Until then, I need to study for a test! That’s now scheduled for the 2ND of August. Guess will just have to wait till this super amazing post comes to an end. Why? ‘cause I’m simply impatient! What do you mean by why? 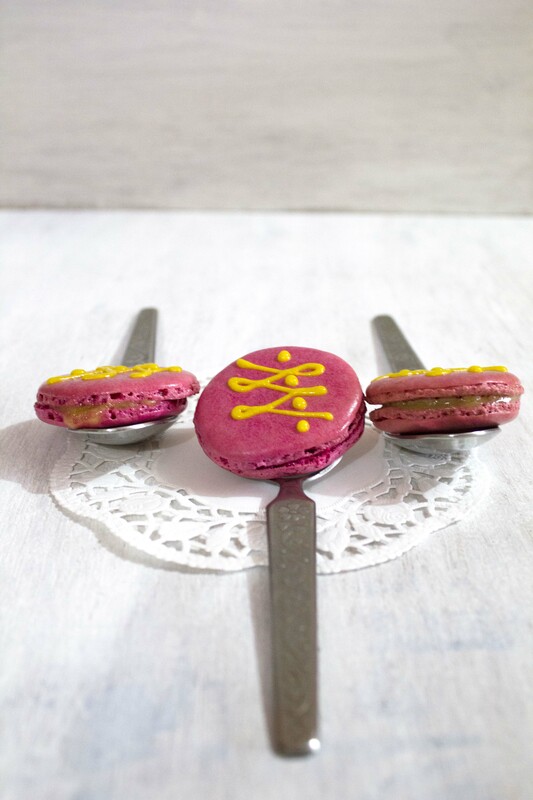 If your first attempt at making THE French Macarons is a success, that alone is reason for celebration! OH MY GOD! I cannot believe that my macarons actually survived! Crisp top and chewy insides! THESE MACARONS HAVE NO NUTS OR SEEDS IN THEM!!!!! Okay, so now, let’s get down to business! 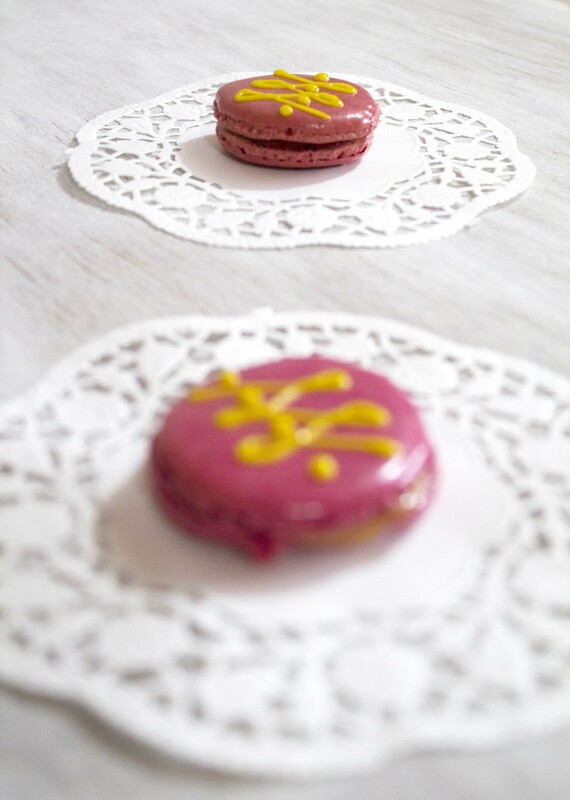 These delicious pink lemonade macarons have a lovely strawberry flavoured shell and lovely tangy lemon curd filling. The first step is to make the lemon curd. Combine all the ingredients and cook on medium heat. Keep stirring. The mixture must thicken. This will approximately take about 8-10 minutes. Once your lemon curd is done, keep it aside to cool. Take an egg white in a clean metal bowl. There should be absolutely no water in the metal bowl. Add the granulated sugar. Start beating the egg whites and sugar till it forms stiff peaks. This should take around 10 minutes. After about 9 minutes, add your food colour and beat for another minute at very high speed. Now comes the tricky part – the Macronage. Before you fold in your icing sugar and powdered strawberry flavoured oats, you must sift it very well. 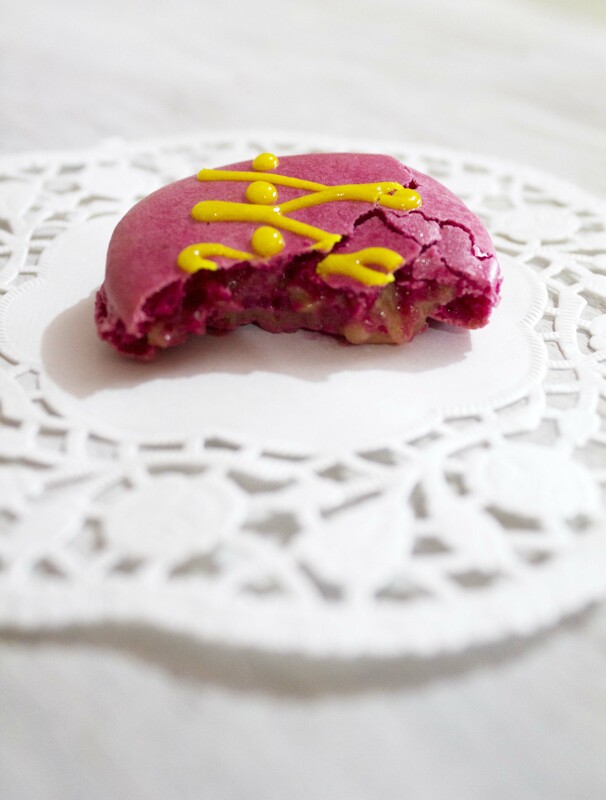 No large chunks of oats will be tolerated by your macaron and your shell may crack! So sift the icing sugar and powdered oats. Now, fold it in and give it about 30-35 strokes. Once you reach 30 strokes, take your spatula and drop a little of the mixture on a plate. It should take only about 30-40 seconds to get uniform again. If it doesn’t, you need to add in a few more strokes. Once that’s done, fill it in your piping bag and pipe small circles on a greaseproof baking parchment. Once that’s done, rap your cookie tray real hard, at least twice on each side. This will knock out any air bubbles. Leave it to sit for about 20-30 minutes and then pop them in the oven that has been preheated to 150 degrees for about 18-20 minutes. Remove them from the oven and let them cool completely (about 10 minutes) before peeling off from the parchment. Spoon a little curd into one shell and cover with the other. So, I hope you’re gonna try this! Thank you sooooooooo much Consuelo!!!!! I’m sooooo glad that you liked it! 🙂 Oh yeah! My mom and grandparents keep complaining that my food makes them fat! -_- 😛 So I had to come up with something so they stop complaining! haha! So pretty! These sound delicious and are absolutely lovely. Thank you sooo muchhhhhh Katrina! 🙂 🙂 I’m sooo glad you liked it!!! These are gorgeous! I can’t believe they don’t have nuts in them! What an adorable color combo! 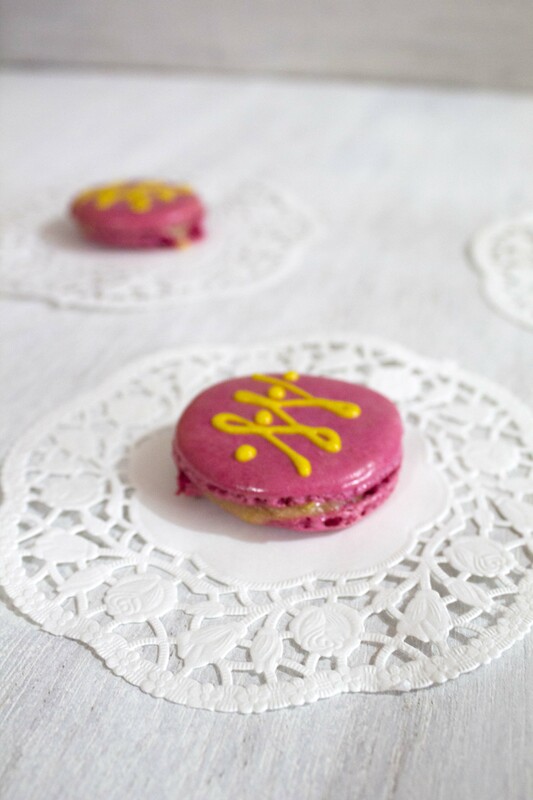 I am way too scared to make macarons (silly, but true) so I’ll just have to stare at yours! Thank you for sharing. How cool!!!! Strawberry oats is GENIUS! I will be trying it, we have peach, strawberry, blueberry and banana flavors as well. Also much cheaper than almond flour. Can’t wait. Whoaaa!!! WOW!!! We don’t get too many flavors here ! Just this strawberry one and a saffron & raisins one. The others are savory! And I totally agree with you! We don’t even get almond flour here! I’d practically have to spend half my monthly allowance on buying almonds and then grinding them! Too much work!! 😀 this is a much better option! Do let me know when you make them! 🙂 🙂 This is sooooo exciting! I cannot believe it, it worked like a charm. I am so excited and cannot wait to try some other flavors. Inaddition to the fruit flavors we also have, maple and brown sugar, apple cinnamon and cinnamon roll flavors. I love experimenting and you really have me thinking. Thanks. These are so pretty. I love the colour contrast. Bet they tasted amazing too! Thankkkk you sooooo much Cass!!!!! Yuuusss Yuuusss!!! The best part about using these instant flavored oats is that you don’t really need to add additional flavoring! You should definitely try it! Could these BE any cuter and more festive to eat??? I heart them. Lots! Hi! I used Quaker oats…but you can use any brand that is available. It always works like a charm! 🙂 I hope you will enjoy making them!